Another release! This time we have some often requested features and a few quality of life improvements. One of the most requested features so far. With 2.4, allTags can now offer thumbnails for PDF, text files (such as .txt, .html, etc.) and many more image types (.webp, .gif, .psd, .xcf, etc.). Most work is done by the excellent ImageMagick set of applications, which can gracefully be included inside of allTags. To create PDFs however, there must be a version of Ghostscript installed on your system. Processing PDFs is a hard task and Ghostscript produced very good results for everything I threw at it. Please make sure, you have Ghostscript installed, if you want to have PDF thumbnails. If you want to change the quality of thumbnails, you can now delete the thumbnail cache in settings. This will cause allTags to dynamically recreate thumbnails while you use the application. Missing thumbnails, like for PDF files that were not supported in the past, are now automatically created. Thumbnails are not being cached between instances any more. Tags can now be toggled in the grid view to show the image preview unobstructed. Many small, visual improvements for object views and sub windows. Welcome to allTags 2.3. This release focuses on quality-of-life improvements and bug fixes. It was delayed as development effort is currently being put towards collaboration features within allTags. Click here, if you want to learn more about it. Now to the new stuff inside 2.3. The grid-view has been redesigned (again) to have less clutter and better image previews. The basic grid-view layout has also been changed. When you disable 'Align to grid', images stop following a fixed grid and use their original proportions. This type of layout is generally called a masonry-layout and works well with images that use different aspect ratios. Lastly, the grid-view receives a zoom function. Somebody asked for it, it was put in and now it feels like it should have always been there. Thank you for requesting this feature, I don´t want to miss it now. The object history has mostly been used to view and recover older file versions. 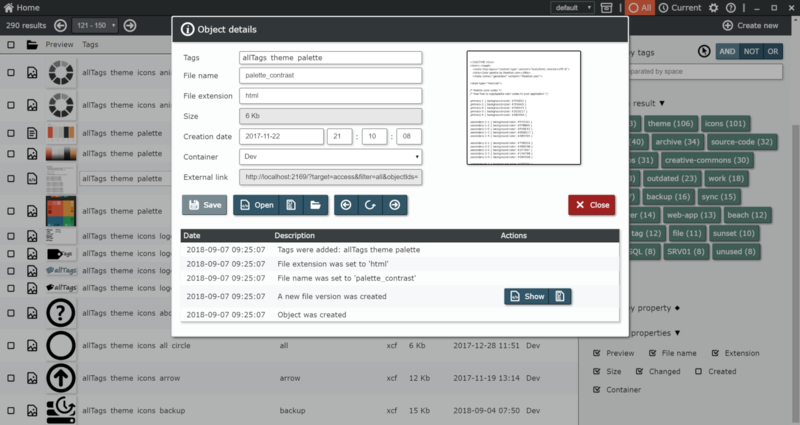 With this release, allTags now tracks changes to object meta data, such as URLs, file names and tags. To keep everything nice and readable, the events are aggregated to show a summary, when appropriate. By clicking on any entry in the upload tracker window, you can now jump directly to the files that were uploaded. The shell was adjusted to look more like traditional applications. It now also shows the window focus state. Pack objects are now handled similar to zip-files, with the contents being opened up separately. Recovering an older file version now creates a new version instead of overwriting the latest one. The working/loading indicator would often not pop-up when the GUI was busy. Not any more. The page selector now actually shows the correct page when navigating backwards through the application. Broken mouse-over texts were re-enabled. This release took more than twice as long as releases in the past. Even as development time is spent on collaboration features, I recognize that not everybody cares for those. Therefore I want to make sure, that regular releases still have nice things for people who just want to deal with their own, personal files. I hope that a good balance can be struck in the coming months. After getting many requests, I am happy to announce that allTags 2.2 now includes its own, native shell. By working with the very useful Electron framework, allTags can now behave similar to a native application. It will run within its own window and can be handled like any other application. If you prefer the old way, you can select 'Use default browser as interface [...]' during the installation wizard; this will cause allTags to run just as before. Users of the portable version can also choose between running allTags (the old browser interface) or allTagsShell (the new, native shell). While doing work on the native shell, I wanted to improve the usability and space efficiency of the user interface so that it more closely matches native applications. The result is a partly rewritten user interface. Though no change is popular with everybody, I hope that the new interface will be an improvement for the vast majority of users. Pages or volumes of comics or mangas. Collections of photographs, which are not worth tagging individually. Object packs should not be used as a form of category. Their content cannot be searched and they cannot be nested (an object pack cannot include other object packs). As they serve very specific use cases, I am very interested to learn, how this feature is received. The object grid view was changed to show more tags with less clutter. It also got an option to show images uncut, meaning that their full proportions are used for previews. Other file types are now represented by a file type preview image instead of the old no-preview-available placeholder. Container handling was improved, moving the default container selection to the container menu inside the menu bar. There were also a couple of bugs in relation to pinned objects and containers that were fixed. New objects can now be assigned to a container during creation. Following a suggestion, I have created a subreddit, where new releases and announcements will also be posted so that anybody can start or join a discussion. Feel free to post anything allTags related there. Today, allTags 2.1 has been released. This new, minor version fixes many outstanding issues, greatly increases stability during heavy write operations and improves tag handling. Tag handling is basically the raison d'etre of allTags. Version 2.1 replaces the old tag input method and brings in a new, consolidated tag input. It allows for faster tag input (and removal), reduces the required screen space and allows for more control of what is displayed. This version improves backend stability considerably. You can now import/upload larger and multiple file sets at once without the application locking up or producing errors. A new progress tracker has been added to show running and completed tasks. allTags now also handles access of existing content during heavy write operations (like when uploading many small files) much more gracefully. You should now be able to use allTags with close to the original performance even when adding thousands of files. After updating the object grid view last version, the list view gets some love. It will show less icons by default, blending in actions when they become useful. It also now includes shortcuts to some often used bulk actions, like opening all files on the page. Many more small improvements and bug fixes are part of this release, so please update to this version to get the best experience using allTags. I am happy to announce the release of the next major version of allTags. 2.0 includes many improvements, bug fixes and of course, new features. So let´s get to them. With containers, allTags supports the separation of data within a single instance. While it was always possible to manage big datasets of different kinds by using tags, now you can dynamically switch between datasets. You can manage your entire data at once or focus on subsets. For example, if allowed, your work and private files can live and be managed in the same instance. 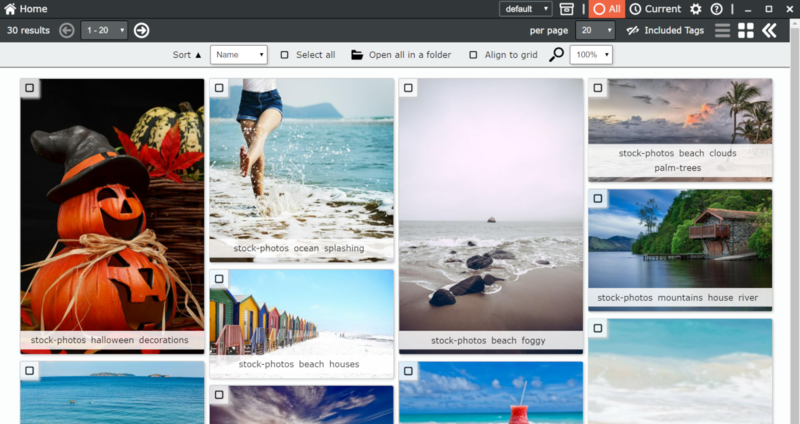 In allTags 2.0, you have the option of separating files via storage paths. With big filesets, storage space can become an issue. With the introduction of containers, it is now possible to divide files between devices, like hard drives or network shares. While separated by storage path, you can still manage all your file objects simultaneously in allTags. The grid view has been redesigned to allow for more images to be handled and now works better on different screen sizes. 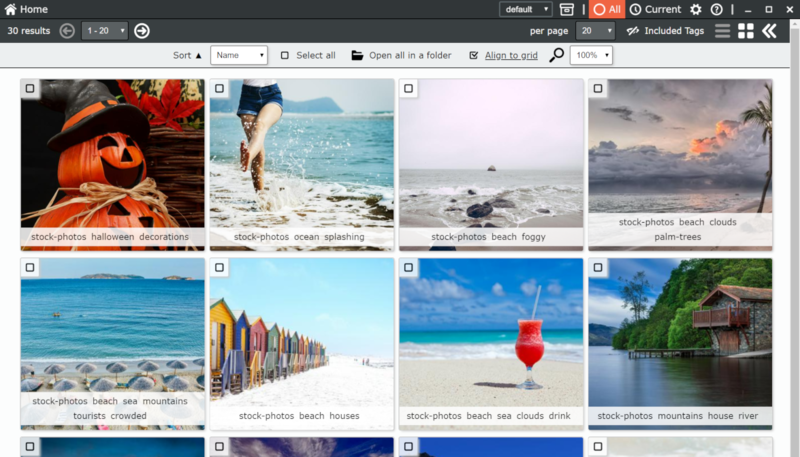 With better grid view, you can now choose to increase size and quality of thumbnails. Newly added images will then look much better, though will take longer to import and their thumbnails will need more space. The versioning function was improved, allowing you to open read-only copies of older versions to check and compare before you decide whether to recover a file. Many client side scripts were replaced with modern CSS standards. This should result in better performance in larger views. Switching between instances is now faster as a lingering database transaction caused a connection time out. Containers in allTags is a major new feature, which, although well tested, will be further improved in coming versions. 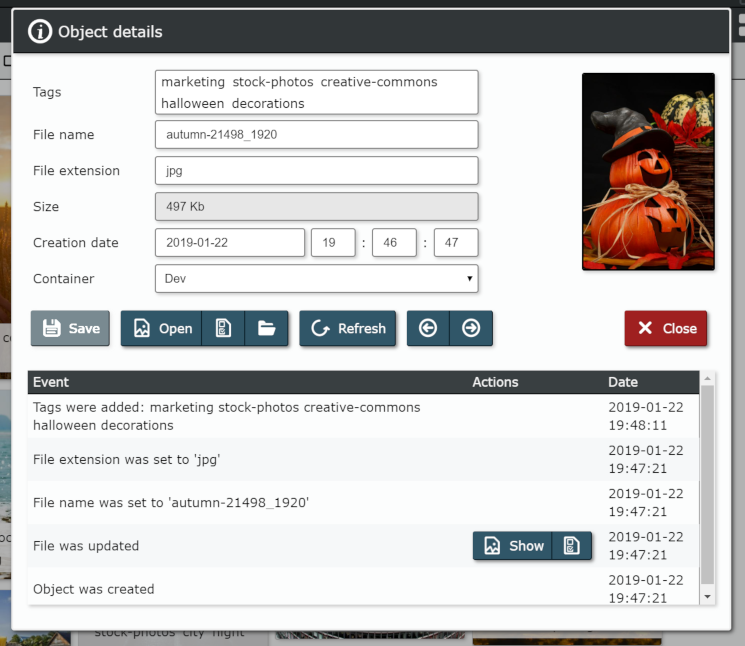 The plan for the next major release is, to focus on making allTags work in team environments as I see many potential benefits of ditching file systems for collaborative work in teams. Thank you for using or being interested in allTags. Critic, feature suggestions or any other feedback is very welcome.